A Cumbrian cancer charity received a grant of £250 from the Cumberland Building Society Charitable Foundation to provide cookery classes to people who have been affected by the disease in our region. The Odyssey Foundation, which was set up by local cancer survivor Sandra Jones, aims to enhance and improve the lives of people in Cumbria who are affected by cancer. The charity’s approach to healthy eating aims to encourage people to eat a whole food diet that includes fresh, unprocessed foods, based on the belief that people are healthiest when they follow a diet composed of foods in their most natural state. 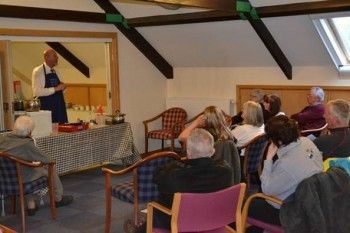 The Odyssey Foundation worked alongside Eden Valley Hospice to deliver the ‘Take Care and Cook’ sessions to anyone who has been affected by cancer in Cumbria. The fun, practical workshops were delivered by celebrity chef John Crouch who demonstrated healthy recipes from the Macmillan Recipe Book. The audience were able to cook along with John while sampling the delicious food throughout the sessions. People who attended the sessions were also given a free recipe book so they could continue to make the healthy recipes at home.